We'd love to know more about the open air schools in Regents Park. If you have memories, or have done any research of your own, please do get in touch. The bandstand in which there was an open air school is not the same one as the bandstand that currently exists in Regents Park. The current one was brought from Richmond Park in the 1970s and stands near the boating lake. The original bandstand was near the zoo. The first of the two schools we were told about was functioning in the mid 1930s in a cnavas hut, up until the point when War broke out. We have few details other than a description of teaching at the school. The second school was in the old bandstand in the park in the 1910s, 20s and perhaps into the 1930s. This is a school about which I have been able to find out precisely nothing. However, I have been sent this extract from the autobiography of Rose Odie and reproduce it here as it is interesting to read about the school from a teacher's perspective. "Poor little things" said the nurses, sitting in their starched dresses, as my thirty poorly dressed children passed by on their way to the canvas shack which was our classroom. "Poor little things", said my children, watching the immaculately dressed infants playing in gloved hands with a large, soft ball. Seeking a change after a long period in one school, I volunteered for the ‘unattached list” and called at the local Education Office. A clerk … said fretfully “I’ve only got two schools and nobody wants them. The first is a Church School.” “No” I said firmly. I had just come from a Church School where two of us taught four classes, talking against each other and the traffic, lorries rumbling over a cobbled yard into the street from a nearby factory. And so it came about that from June 1934 until the war, I taught a class of mentally retarded, physically delicate or just plan troublesome children in a canvas hut in Regent’s Park, set in a grass plot near a lake. I faced their desks in the open-air room, closed on three sides. Behind me the children could see a little creek gay with the tall white parsley, water weeds and other wild flowers. Here birds came to drink, or a squirrel lolloped by. Many lessons, games and playbreak were enjoyed out in the open on the grass. In the winter we stayed in the London County Council School to which I was attached. With lunch and exercise books in khaki satchels slung on their backs, the children walked, crossing five roads, to the park. Standing in the road, I held up the traffic. Once, without noticing, I held up a CID car. The occupants saluted me as I released them; the class was impressed. In the park they could talk and compare ‘findings’. These might be leaves, a father, an acorn – once the bleached skeleton of a bird, and served for several lessons. We drew them and discussed them. Every finder could read at least the sentence on the board, dictated by himself on his treasure. This was a great help as several could barely read at all. The ‘conker’ season was heaven and I umpired the final contest. Strings had to be of equal length and thickness, and the stance steady. The great fight was drawn, described, made reading and writing matter, and even arithmetic – for times and attempts were recorded. Strings of acorns and chestnuts in tens, twelves, and twenties were a help in arithmetic. Proudly one such would be deposited on my desk. “I don’t need this any more” as progress was made. Would they! We crowded on the boat (whether I broke any rules I don’t know) and rode all round the lake, passing nesting swans and a duck followed by her brood of nine. On one walk, the whole class left me suddenly, rushed forward shouting. Edgar returned first. “It’s alright, Madam, it’s only the big house on fire. We were afraid it was our shack. This munificent house, home of the Woolworth millionaires, Barbara Hutton, famous among other luxuries for the gold taps in the bathroom, was on the other side of our fence. So they all came back greatly relieved and we watched the fire until it died down. One Monday we arrived to find the cupboard in the shack had been broken open, books scattered over the enclosure and the park. This was sacrilege. The children were very upset. I bought a strong padlock for future security. That week I noticed some of the small boys looking tired and listless. Girls told me the reason. Four staunch ten-year olds, armed with sticks, had kept guard outside our fence until closing time. Catching up with lessons was only part of my job. Children who had been at the bottom of the class had to have their confidence and self-resect restored, sickly children, tubercular suspects, had to be watched. As we were together all day, social, not merely school manners, had to be acquired. At first lunches brought often consisted of thick slices of bread and jam, cakes, and too many sweets. Parents were persuaded to give cheese, egg or meat sandwiches, something of a salad nature, a fruit to follow and wrap the food in a cloth. Water was to be had from a fountain nearby.Our luncheon parties were pleasant affairs. Clean cloths, little water pots holding buttercups and daisies or leaves, brightened the desks. I ate my luncheon opposite to them, and we talked together. Crumbs were shaken on the grass in front, shared by birds and a little squirrel. I learnt a great deal in those years. Some of the children were not mentally subnormal, but their minds worked slowly. They had to be given time to go at their own rate. In large classes with fixed time tables this was rarely possible. Nor was understanding their difficulties enough. They would have to face life without excuses, to overcome handicaps. Others who lived in a house containing several families, but with only one tap in the yard had to be clean, and arrive in time. To achieve this, they had to get up earlier. Some were too ebullient; boys who, nice in themselves, were just a nuisance in a normal class. They had more scope in the Park class, so much to do and to work at, that there were more opportunities for letting off steam. Part of the toughening process was homework – a few minutes of something they could do alone. I knew that this might have to be done under difficulties, amidst noise, or on an uncleared table. At first it was a privilege, only pupils who had gained three stars (a star was given for individual improvement) were given any. “Neddy tries harder in school”. Soon all the class were doing homework. War, and evacuation closed the school and disbanded our class. "I was excited to find there was an article about the Open Air School in Regents Park, since my mother told us she had been a pupil there. However this school dated 1934 was not the one my mother described. Born in 1912, she went to school on the bandstand in about 1920. It was closed in 1924." Digging a bit deeper, we found that there certainly was another open air school in Regents Park. The 'Lost Hospitals of London' website has details of a school which could be the one that Jacqueline's mother went to. This school in the bandstand was open from around 1910 to around 1939 and was a day school for children who were weak or 'pre-tuberculosis'. "The children attended in all weathers and were provided with shawls and foot coverings when it rained." The site also makes it clear that the bandstand which housed the classes was not the same one that is there now. Not long afterwards my mother was taken by the Doctor to stand in front of various boards who were trying to close the school. They succeeded and my mother, who was still school age was returned to the local board school (about 1924?) She was very critical of the stuffy, overcrowded classrooms. I guess there is an indication here that although the bandstand school spanned many years it had varying fortunes and was not open consistently over the period and flourishing with several teachers. Perhaps these details will encourage others to recount their own parent /grandparent's experiences of my mother's fellow students." "In 1910, with the aid of friends and the St. Marylebone Tuberculosis Dispensary, I sought to found an open-air school on simple lines in a London park. A small meeting was held, at which the parents of a few children predisposed to tuberculosis were present. 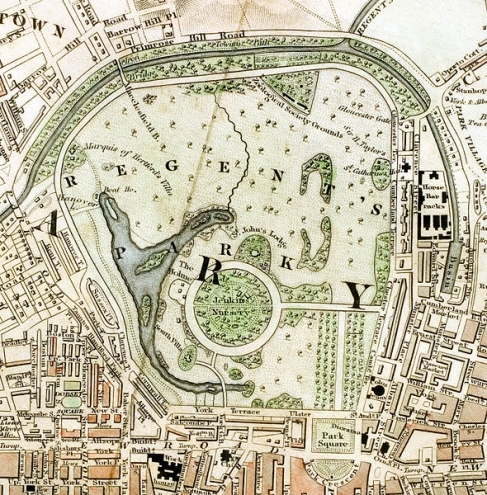 The parents were told that as they were living under poor and overcrowded conditions, their children would have a better chance if their days were spent in Regent’s Park. They would have to provide their children with dinner to be eaten in the park, and also contribute sixpence a week towards the services of a nursemaid, a girl of sixteen." The school ran from 1910 to 1929.